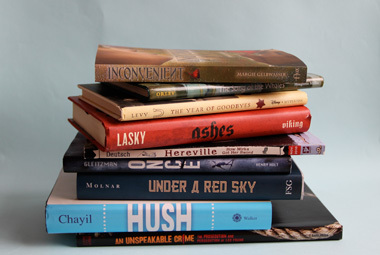 Last week in Tablet magazine I wrote about my favorite Jewy picture books of 2010. This week I wrote about my favorite graphic novels and chapter books. Let us discuss the choices and also some books I really liked that didn’t quite make the final cut.For what it’s worth, I’m hearing almost NOTHING in the mainstream press about the Leo Frank book, An Unspeakable Crime , by Anne Marie Alphin. And IT IS SO GOOD. Adults who enjoy true crime stories — or want to know the story behind the musical Parade — should read it. BECAUSE IT IS SO GOOD. THAT IS WHY I AM SHOUTING. And bummer that the Amazon reviews are dominated by people pointing out small errors without being able to refute the truly horrific big picture the book presents. There were some other books I liked that didn’t quite make the list. I freaking LOVED Older Than the Stars by Karen C. Fox, illustrated by Nancy Davis. It’s a “this is the house that Jack built”-style poem about the Big Bang Theory. Sounds off-putting, but I swear, it’s delightful. It was hard to justify as a Jewish book, which is the only reason it didn’t make my list. To me, the miracle that is the universe’s origin is evidence of Hashem’s wonders…but since the book wisely does not mention God, only science, I couldn’t in good conscience put it on a best Jewy books list. But you know, it would make a great pairing with Ashes , a book that did make my final list, in which Albert Einstein is an important character and there’s lots of star and universe imagery. Older Than the Stars works as a straight-up poem, but there are also text boxes on each page that go deeper into the science. And the art is wonderful. Gorgeous, gorgeous book. I loved the luminous cute-as-well-as-beautiful paintings in Cakes and Miracles: A Purim Tale by Barbara Diamond Goldin, illustrated by Jaime Zollars; I see from an interview with Zollars that she’s influenced by the Flemish masters. It shows. Girl is GOOD. But I found the text a little sweetsy and flat…and I see from the smart folks on Goodreads that the story and language were simplified and de-scarified a bit in this edition (it was originally published in 1991; this is a re-issue with new illustrations). It would still make a lovely Purim gift, though. And I can’t wait to see more from Jaime Zollars. I had the opposite prob with Baxter, the Pig Who Wanted to Be Kosher — really enjoyed the story, loathed the art. Felt bad not including the book, because Laurel Snyder sounds like such a mensch as a human. And Maxie and I both enjoyed Snyder’s Inside the Slidy Diner , with art by, HELLO, Jaime Zollars. I’ve also enjoyed Snyder’s non-fiction writing about interfaith issues. But the illustrations in Baxter just hit me all kinds of wrong — too flat and cartoony, with collage treatments that just didn’t feel lively or nuanced. Wah. Not distinguished, but fun, is The Life and Opinions of Amy Finawitz by Laura Toffler-Corrie. I’m going to give it to Josie (age 9, big reader); I’m curious to hear her review. I loved the humor and the quirk and the NYC setting and the fact that this is a contemporary story (how many middle-grade and teen Holocaust novels have I read at this point? YAY AMY FINAWITZ FOR BEING A FUNNY, NON-HORRIFIC CHANGE OF PACE) and the use of an immigration curriculum to teach the somewhat narcissistic Amy a little personal growth. The fact that the protagonist is frequently unpleasant rings really true — hello, realistic tween! Alas, the epistolary format didn’t entirely work for me; it made the narrative a bit static. We’re only privy to Amy’s side of her email correspondence with her pal Callie, so the author has to make Amy recap what Callie has said in her emails — the result is a bit stilted. But it’s a sweet, fun book. Back on the picture book tip, Modeh Ani: A Good Morning Book is a nice choice for families with even a modicum of ritual observance. It’s a companion to The Bedtime Sh’ma by the same author-illustrator team, Sarah Gershman and Kristina Swarner. (Swarner illustrated Howard Schwartz’s Gathering Sparks , which made my best picture-book list this year.) Both are peaceful, gentle books for very young children about gratitude — the Sh’ma is about reflection at the end of the day; Modeh Ani is about starting the day with joy and optimism. The Shm’a has a palette of deep, restful blues; Modeh Ani features brighter blues and sunny yellows. Swarner’s illustrations are always lovely, slightly wispy and folk-arty. You know what? Just buy ’em all.